Doc and a Drink is ALL NEW! Doc and a Drink has been going through many changes. Most notably, my partner in crime has decided to leave the D&D team. I took a sabbatical from the blog. I wasn’t sure if I was going to continue but, I am going to push forward. I apologize for the break in coverage. We now have a new look and a new style. The post will have more pictures, more links, and less verbage. I just went to SIlver Docs today and I’ll be posting my review soon! This is a true EPIC documentary. Well, actually it’s a mini-series. If you like 48 hrs mystery and Law and Order you will really enjoy this series. It’s 8 x 45min programs on 2 DVDs. This weekend I conquered the first half. It’s a more honest look at a serious murder case in real-time. The access is unbelievable on both sides but, specially the defense side. You can expect the same twist and turns of a well written drama. I jumped between the two “sides” several times. I really became addicted to the series in the 3rd piece. SUMMARY: The Sundance Channel’s consistently absorbing, often riveting The Staircase chronicles a sensational North Carolina murder case from the crime to the verdict. When Kathleen Peterson was found dead in her Durham, NC mansion in December ’01, her husband, novelist Michael Peterson, claimed she had fallen down a narrow staircase. The authorities disagreed, and Peterson was charged with first degree murder. The filmmakers follow the prosecution investigators to Texas, where we see a body exhumed; there’s even a trip to Germany to look into a previous death in which Peterson may or may not have been involved. Only two key elements remain unexplained: What went on in the jury room during deliberations? And did Peterson do it, or not? Only he knows, and he ain’t talkin’. 4 out of 5 Cheers — Perfect for a long rainy weekend. I only wish it was streaming on Netflicks. This film was recommended by my friend – Craig G. We got into a discussion about the most F*ed up movies/documentaries that we’ve seen . 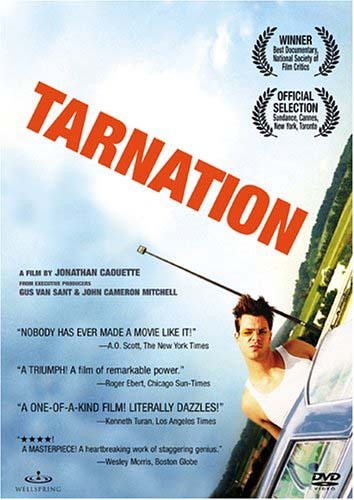 I think the conversation started with “Happiness” but, it definitely ended with the documentary “Tarnation”.He said “you have to see tarnation”. General Plot: Filmmaker Jonathan Caouette’s documentary on growing up with his schizophrenic mother — a mixture of snapshots, Super-8, answering machine messages, video diaries, early short films, and more — culled from 19 years of his life. Yes, the story was sad. But, I focused on the good things about the film. I got to experience – first hand – how a person’s parents shape them as a child and continue to permeate their life as adult – even if they are nuts. The most impressive thing was the amount of video gathered from the main character’s childhood. I was impressed by the density of footage, audio recordings, and photographs collected for the film. He showed all of his family’s faults. I am sure that wasn’t easy but, hopefully –it was therapeutic. The film was all about the filmmaker. This was the films advantage and main disadvantage. I can’t imagine the director doing another film. This one was so indulgent. It was the type of indulgent usually reserved for well-known narrative directors like Quentin Tarantino. Filmmaker Jon Alpert takes a camera and follows King Tone, the “Inca” of the Almighty Latin King and Queen Nation in New York, a street gang. King Tone runs an organized, tightly knit group, holding regular congressional-like meetings where representatives from other Latin King districts gather to pay their respects and pledge their allegience. He preaches to his Kings and Queens that they should not shoot, and they should stay away from drugs. He takes his message of Puerto Rican pride to his heart, and delights in his family. He’s got a chance as a grassroots hero. Unfortunately, the story ends unheroically. It’s easy to see why King Tone is a natural leader. He wants to be a person who does something really great with his life. He’s infectious, playful, heartfelt, organized, and an excellent fiery speaker. Unfortunately, he’s also unable to resist the temptations of drugs. When he’s finally locked behind bars, his world comes crashing to an end. Jon Alpert watches all of this unfold with an unflinching one-man band that doesn’t look away from the good, the brutal, or the bad. That the camerawork is somewhat uncreative is totally fine. This filmmaker earns his value by walking in a world few would dare. He earns the trust of his subjects, and obviously feels a great responsibility to paint the story fairly. There are no villains here. Mr. Alpert also serves as our de facto narrator, peppering Tone with questions that the audience who doesn’t understand this world needs to know. He’s got balls, he’s got commitment, he’s got fairness, he’s got story, and there is definitely something at stake. For a low-budget film, it impressively dynamic. It’s rare that I watch a feature film all the way through and didn’t wish it was a short. This kept me in it. It was interesting, and I definitely walked in another world. It did lag a bit, and, as mentioned, the low-budget one-man band camera style can be a little wearing. All in all though, a good movie. But I like Blog Critics take on it best. P.S. Among the many morality tales of this film – please make a special note of one lesson Tone learned the hard way. Don’t go cheating on your woman just before you get locked away, even if it might seem like a good idea at the time. Prison is real lonely when she takes your kids, smashes your stuff, and moves to Connecticut. None of the other girls come visit you later, and neither does she. Or at least not without a whole lotta work on your part. Dude, this one totally rocks. This amazingly huge dude pumps iron at Gold’s Gym and wonders if he should do something else with his life – like steroids. I mean, of course, why not? Everyone else is doing it. Well, not me. But like everyone in his family, all of his heroes, every upstanding American he knows, you know, all of those people are doing it. FYI for the documentary crowd : The Academy has announced this years nominees for the “Best Feature Doc” for the 82nd Annual Oscars. The list includes The Cove, Burma VJ, and Food,Inc. All docs that I wanted to see but haven’t yet….. I guess it is no surprise by Doc&aDrink’s lack of “5 out of 5 Cheers” we have not seen any of the nominees. That’s Right – not one! I guess we have a lot of viewing to do …… stay tuned. It’s been a while but Katy and I reunited this week for a Documentary viewing. 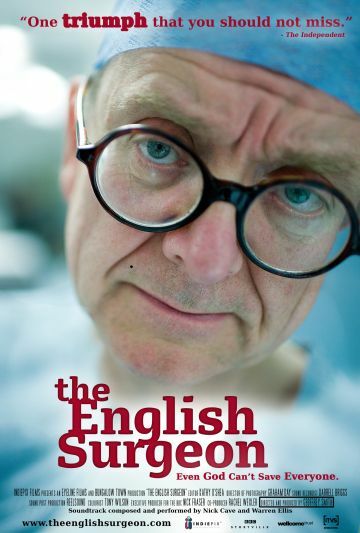 As promised in a previous post – I reviewed the English Surgeon in anticipation of the new film by Geoffery Smith. Netflicks Summary: Get acquainted with the work of British brain surgeon Henry Marsh, who, since his haunting first visit to a Russian hospital in the early 1990s, has been devoted to founding a quality brain surgery clinic in the former Soviet Union. Marsh cobbles together secondhand tools and used equipment from hospitals in the U.K. to treat patients in need, such as Marian, a Ukrainian man for whom Marsh is his greatest hope. The first thing that stands out is how “very BBC” the visuals and story telling style is for this film. This story was not assisted but a narrator which left the viewer a bit sleepy at a few points. We were just sitting – waiting – for the narrator to push the story ahead. I was a little disappointed by the tre conservative camerawork. And low and behold – it was sponsored by the BBC. On the upside – the English Surgeon did have the most tactile face I’ve seen in quite a while. And the English Surgeon in combination with his Ukrainian counterpart were funny, insightful, and humanistic as characters. Thier interaction inspired laughter and conversation. I also have to admit I laughed OUT LOUD at least 3 points in the film. On the other hand – I fell asleep about 1 hour in and woke up 15 minutes later. At least I wasn’t the only one who took a cat nap during the same segment……. I think I can speak for Katy when I say that we both found the need to talk a bit about life, the health care system. and hard choices as the credits rolled. It wasn’t the best but it wasn’t the worst. Too bad it wasn’t just 1 hour I think it would have been a 4 out of 5…..